A group of inspirational volunteers from Bath have raised an incredible £14,000 for the planned Dyson Cancer Centre at the Royal United Hospital. The Bath RUH Community Group started in April 2015 and their latest donation, a cheque for £4,000, has been presented to the hospital’s charity, The Forever Friends Appeal. Last November, the group became official Community Partners of the charity, after raising £10,000 for the RUH Cancer Care Campaign. Bath resident, Amanda Appleyard and member of the Bath RUH community group said: ‘’I’ve seen some of my friends’ battle with cancer and having visited the RUH’s oncology William Budd ward, I could see just how important a new Cancer Centre is – the hospital’s current facilities just don’t reflect the excellent nursing of their patients. “We are pleased to hand over our latest donation which was raised at our cake and craft sales over the Christmas period. With over £9 million raised for the pioneering new Dyson Caner Centre, The Forever Friends Appeal, now in its 20th year continues to fundraise for the Cancer Centre to ensure it becomes a truly special in its design, facilities and equipment. Lauren Noble, Senior Community Fundraiser, The Forever Friends Appeal said: ‘’It’s a pleasure working with the Bath RUH Fundraising Group – we always have a lot of fun at meetings and fundraising events. 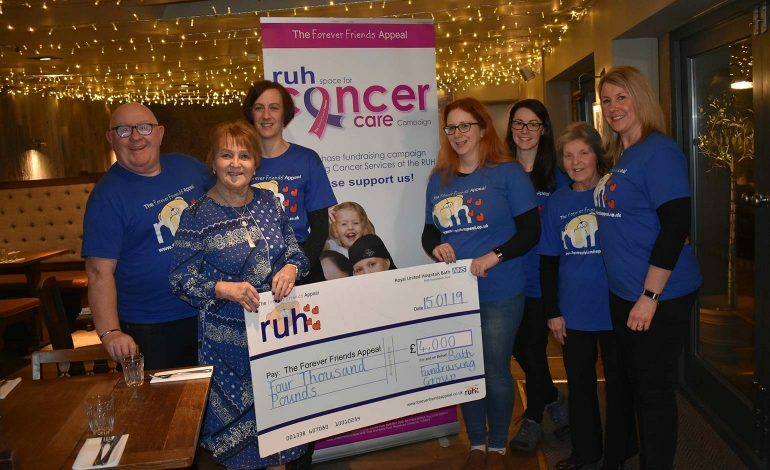 Every month, the group meets at The Locksbrook Inn, Bath to plan fundraising events for the RUH Cancer Care Campaign and new members are always welcome to join. Anyone interested in finding out about joining the Bath RUH community group or setting up their own community group to raise money for the RUH, can contact Lauren Noble, Senior Community Fundraiser on 01225 824013 or email lauren.noble1@nhs.net.